BlogPublished ArticlesPublished TextsThe Award Review Tribunal – An Answer to the Issues of Enforcement of Arbitral Awards in Nigeria? There is currently a bill before the National Assembly for the amendment of the Arbitration and Conciliation Act (ACA) 1988. The Arbitration and Conciliation Act (Repeal and Re-enactment) Bill (The Bill) has successfully passed through the Senate and awaits the concurrence of the House of Representatives and the assent of the President to become law. Why the need to reform the Arbitration and Conciliation Act (ACA)? Under the present framework, “lengthy” and “expensive” are words that are often used to describe arbitration proceedings in Nigeria. Further, Nigerian courts have severally been criticized for their unwelcome intervention in arbitration proceedings. This is despite the pro-arbitration stance and even Practice Directions form the Chief Justice of Nigeria encouraging the judiciary to embrace arbitration as a means of dispute resolution. The bill as proposed aims to tackle these issues amongst others. It is noteworthy that, the ACA is based on the provisions of the UNCITRAL Model Law. Over the course of time, has extensively developed the model law in conformity with the trends in international business. Regrettably, the ACA has not kept track with the work of UNCITRAL and advancements in the world. The 1988 legislation is now 30 years old. Since 1988 there have been various developments in the way businessmen do business and in the way lawyers practice. In other words, the ACA is outdated. One of the core objectives of this reform effort is to bring the arbitration law in Nigeria more in line with certain global advancements in arbitration and to address some practical gaps – making it more effective and attractive to users. Another reason, perhaps the most fundamental, is that the existing legislation does not take account of the peculiarities of the Nigerian environment for the enforcement of contracts and enforcement of contractual obligations. In spite of having legislation that’s based on what a good number of people around the world considered to be ideal model legislation, and in spite of the fact that many countries have adopted this model law, we still continue to experience incidences of protracted litigation due to the local peculiarities of our local environment. When an arbitration proceeding eventually comes to a conclusion, enforcement can be quite problematic if the losing party decides to challenge and set aside the arbitral award. Under the present framework, the scope for courts to review arbitral awards is very wide and is, in effect; almost comparable to the full merits review that applies to first instance court decisions. Indeed, there’s an extent to which the ACA should have been faithful enough to one of the most fundamental principles of the Uncitral model law, that is, the very limited scope for judicial review of arbitral awards. However, the ACA, instead of keeping the narrow grounds that is obtainable in the Uncitral Model law, has made it possible to challenge awards on grounds of misconduct. In other words, the old common law principle of misconduct which pretty much almost turns an award into the same thing as a judgment with the potential for full merits review was imported. This has been successfully exploited by lawyers to make the system not what it was expected to be. There is now an increasing perception particularly as it concerns enforcement that arbitration is simply a form of pre-trial proceedings because after a successful party obtains an award, the enforcement process becomes litigation in and of itself in the sense of going to a court of the first instance and appellate levels. Thus finality of awards, which is one of the strongest advantages of arbitration, is not something which the current legislation in its current form really assures. For these reasons it was considered that there was a need to reform the legislation. In an attempt to tackle this issue, the Bill has removed the concept of “misconduct” and aligned the grounds on which awards may be challenged with the more limited “due process” and “jurisdictional” grounds contained in the UNCITRAL Model Law and the New Your Convention. The Bill has also taken a bold step to address this issue by considerably reducing the wide scope for judicial review that currently exists and, in its place, providing for an appellate level arbitral process that will review the award of first instance arbitral tribunals. The Award Review Tribunal as contained in Section 55 (7) – 55 (14) of the Bill is one of the more interesting innovations in the Bill. The creation of the award review tribunal is an innovative step which will go a long way in ensuring the finality and preservation of arbitral awards. The concept of the Award Review Tribunal, in a sense one could say, is inspired by what is obtainable at the International Centre for Settlement of Investment Disputes (ICSID). This proceeding for nullification is a second legal arbitration. It’s effectively an appellate layer of arbitration. What is obtainable in the Bill is an “opt-in” provision. 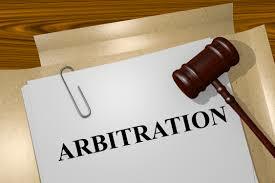 Parties are required to specifically choose it in their arbitration agreement thus making it optional. This is one of the fundamental features of the concept. Parties have to opt into it for it to be applicable to the transaction. Parties are given the option to refer their awards to the tribunal for review instead of going to a court of the first instance to set aside an award. The award review tribunal is expected to conclude the review within three months and either uphold or set aside the award in whole or in part. An award that has been upheld by the award review tribunal can only be set aside by a court on the limited grounds of arbitrability and/or public policy. The philosophy behind this was, mainly, to balance 2 concerns. The first concern, of course, was finality. Parties do not want a process which they had agreed from the start to be determined by private persons to end up taken over by a three-tiered judicial process, for an average duration of 11 to 15 years. That sort of environment isn’t conducive for the concept of finality which is supposed to be one of the most attractive features of arbitration. The Bill ensures finality by providing for just two grounds on which any party can go to court. These two grounds are areas which the state has a legitimate interest in regulating. First of all, the state has a legitimate interest in deciding which issues will be arbitrable and which will not be, and this is settled by legislation. Another concern is how then does the Bill ensure that the process enjoys finality, except on only those two narrow grounds of intervention by the courts? How do parties address rogue arbitrators and conspicuous errors in the award? The review tribunal takes this concern into account by providing a second bite at the cherry. The review tribunal is one that operates with the same efficiency that arbitration itself operates. The Bill proposes that this appellate tribunal would simply be looking at paperwork/documentation. It would not be taking witnesses’ evidence or anything. This would leave room for the tribunal to focus on errors in the award or for rogue arbitrator decisions. There have been mixed reviews about this innovation. Concerns have been raised about the applicability and effectiveness of this appellate tribunal. One of such concerns is that it adds to the complexity of arbitration and it adds yet another layer similar to litigation because recalcitrant parties will always find a way to attack the award on the merits. Another possible argument would be that restricting the grounds on which a court can review the award might be contrary to the constitutional rights of access to courts. Yet another concern is that perhaps this provision would have been better placed in the rules of arbitral institutions rather than in a federal enactment. 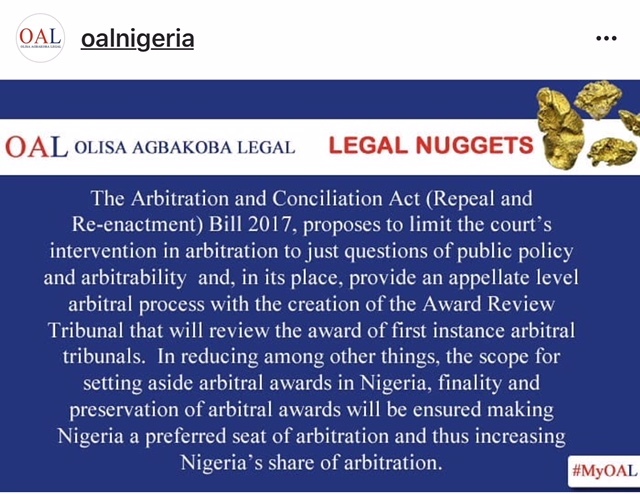 Addressing the issue of unconstitutionality, arbitration as a dispute resolution mechanism in Nigeria, as it currently exists, has been argued to be unconstitutional. Even the current legislation contains restrictions on the grounds on which the parties can approach the court. The objective of this proposal in the Bill is that this restriction has proven to be insufficient to achieve the objective that was originally intended. 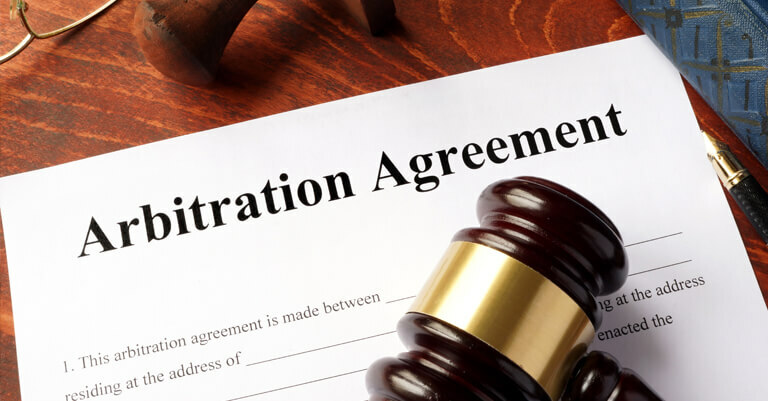 If it is then accepted in theory that there is a restriction, then the current arbitration act itself is already susceptible to challenge on the basis that it is unconstitutional. On whether these provisions on an appellate tier review is best placed in the rules of arbitral institutions rather than an enactment from the federal legislature, indeed, arbitral institutions can implement a review level of arbitration within their rules. For instance, the ICC has a review level in the form of the award scrutiny contained in the ICC Rules. What the Bill proposes goes beyond the contemplation of the ICC Scrutiny. The Bill proposes to further limit, through the review tribunal, the court’s intervention in arbitration to just questions of public policy and arbitrability. This cannot be achieved through the rules of an arbitral institution. In actual fact, if this is introduced in the rules of an arbitral institution, the process would then become susceptible to another level in an already very lengthy process. This is because after the review stage process there would, without a doubt, be a further review instituted by dis-satisfied parties at the courts’ level on the grounds contained in the current legislature. Therefore, if this proposal is introduced into rules of arbitral institutions only, then the Courts will still be able to review awards on all the seven grounds thereby further compounding the problem the bill seeks to solve and nothing would have been accomplished. It must be emphasized that the Bill as it stands still contains all the grounds in the UNCITRAL Model Law on which an award can be reviewed. However, these grounds are limited in application to the review tribunal, whilst the court’s intervention is limited to just public policy and arbitrability. In conclusion, enlightenment has a huge role to play in the implementation and the development of arbitration in Nigeria. There has to be a lot of sensitization of all the relevant stakeholders from the courts to the lawyers, and to the business community itself. People’s minds have to be prepared for the environment in which there is very limited scope for having recourse against arbitral awards. Arbitration in Nigeria, after 30 years of its legislation, is unfortunately still at its infancy. For Arbitration in Nigeria to reach its intended potential, innovations such as the Award Review Tribunal has to be embraced by the stakeholders. Arbitral Institutions will also do well to sensitize and encourage their members to take full advantage of innovations. It is hoped that the Award Review Tribunal is met with the same welcome and support, innovations such as the emergency arbitrator procedure were met with globally. We will only know how effective the Award Review Tribunal will be in tackling the issues of enforcement of arbitral awards in Nigeria if the Legislature takes the much-needed step of passing the Bill into law and disputing parties take full advantage of the innovations such as the Award Review Tribunal contained in the bill.